Bitter Gourd Chips Recipe- Learn how to make Bitter Gourd Chips step by step on Hyderabadi Ruchulu. Who doesn’t like chips ? I’m sure there would not be a single hand out there that would have raised ? Today’s post is for all chips lovers ,here comes Hot chips style “Bitter gourd Chips” recreated in my kitchen.The spicy crispies with a very very mild bitterness in it makes a great teatime snack. Make sure you slice the bitter gourd evenly so that while frying it gets cooked evenly. Instead of water , you can add 1 -2 tsp of hot oil to the spice powder + bitter gourd mixture. This will make them more crispy. Also the surface of chips will not look dry. 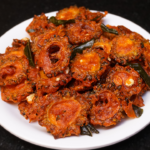 When u r adding bitter gourd slice, flame should be medium high.Later reduce to medium low.While frying, fry until sshhh.. sound stops.This is very important to get crispy gourds. If you want simple chips, just mix salt and chilli powder to karela and deep fry. or you want a south Indian taste omit all spice powder, just add sambar powder n a pinch of hing. very nice recipe. Thank you for sharing.